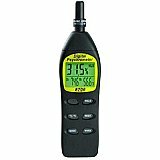 Measures Relative Humidity, Ambient Temperature, Dew Point, Wet Bulb and Absolute Humidity. 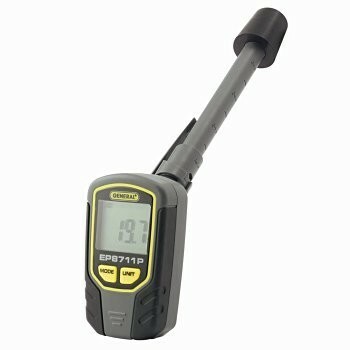 The placement of the Digital Psychrometer Meter's humidity and temperature sensors at the end of the 6" long probe makes it possible to take readings inside ductwork. 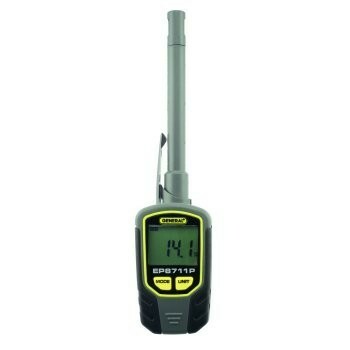 The psychrometer probe’s ability to swivel increases positioning options to accommodate optimal view of the LCD. If there is no vent or grille nearby, a temporary hole can be drilled in the ductwork and the probe inserted through it. A black rubber bushing is included for this purpose. Inserting the probe through the bushing will extend the sensor 4 inches into the duct. A rotating protective cap safeguards the humidity and temperature sensors at the probe tip when not in use. The Digital Psychromter EP8711P’s pocket/belt clip makes the instrument ultra-portable and convenient. As an instrument with multiple measurement capacities, the EP8711P offers great versatility and utility, increases productivity and efficiency on the job, and gives technicians more bang for their buck. Purchasing just one instrument capable of making multiple measurements is clearly more cost-effective than buying several separate devices. Plus, it makes a technician's job easier by reducing the number of instruments they have to transport to and carry around at jobsites. 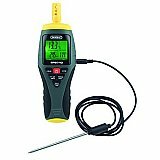 Ideal for water damage restoration, contractors, and professionals charged with monitoring and maintaining the environment of facilities such as office buildings, greenhouses, food and equipment storage facilities, wineries, freezers, shipping containers, computer rooms, labs, libraries, museums and saunas. Integral 6 in. long sensor-tipped probe for measuring conditions inside ductwork. Probe swivels, increasing placement options.